Anthony Hart reviews a virtuoso accordion performance at the opening of this year’s Bir Miftuħ Festival. In the introduction to the opening concert of the 20th edition of the Bir Miftuh Festival, organised by Din l-Art Ħelwa, the audience was promised an unusual and interesting evening. This was no exaggeration. The venue for this evening was the splendid mediaeval chapel of Santa Marija ta’ Bir Miftuh and featured the young Italian accordionist, Pietro Roffi. I must admit when I was invited to this recital I was a bit sceptical as to whether it was possible to sit through an hour or so of music for accordion. As soon as Roffi played the first piece, my fears were allayed and I, as well as a packed audience, enjoyed a wonderful evening of virtuosic playing. Roffi showed a remarkable talent on his chosen instrument. At only 24, he displayed a technique that was stylistically and technically brilliant and demonstrated a complete mastery of this complex instrument. 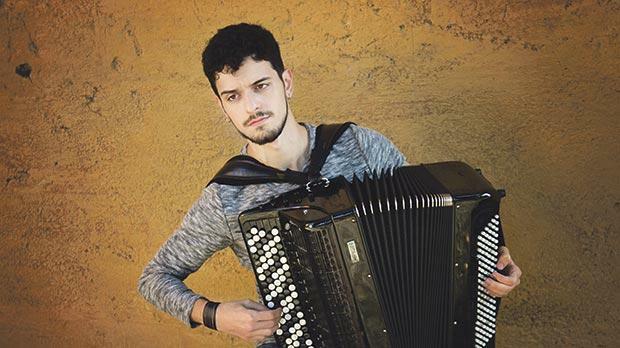 Pietro Roffi, born near Rome in 1992, studied classical accordion at the Santa Cecilia Conservatory in Rome. He started his concert career in 2011 as a soloist and chamber musician, playing baroque music, written for organ and harpsichord, 19th and 20th century piano music and original music written especially for the accordion. Music is universal, evoking emotions in both performer and the listener. Given the musicianship, virtuosity and total command of the instrument, coupled with an understanding of the emotional effects of the music intended by the composer, it is possible to convey those emotions and to give an outstanding performance of the work on any instrument. This is true of this young performer who exhibited all of these qualities. The programme, titled Solo Voyage, for this recital included a varied selection of music ranging from the 18th century to the 20th. In his arrangement of Vivaldi’s L’Inverno from the Four Seasons, it was possible to hear the solo violin clearly as well as the flute. The performance of this familiar work was flawless and provided us with a completely new rendering of this work. After a transcription of Janácek’s Our Evenings, originally composed for piano, we heard the familiar tango sounds of Astor Piazzolla. His Ave Maria was played with a poignancy evoking a sense of calmness and devotion. The central part of this recital included five of Edvard Grieg’s Lyric Pieces. Originally composed for the piano, these were performed with sensitivity and expressiveness of the original piano interpretations, the accordion version providing an added depth to these works. The dynamic range of the instrument was demonstrated, from the soft subtle tones of the piano pieces to the violence depicted in Gorka Hernosa’s work, Gernika 26/4/1937, which depicts the story of the Nazi bomb attack in 1937 on the Basque town of Guernica during the Spanish Civil War, concluding with an “explosive” final chord. The performance was received with a rapturous ovation from the appreciative audience. The concert was held under the patronage of the Italian Embassy with the support of the Istituto Italiano di Cultura. It was thanks to the institute’s director, Salvatore Schirmo, that we had the privilege of hearing this talented musician and it is hoped that we shall have the opportunity to sample his playing in the not too distant future.